Yesterday Peter Greene expanded on an idea I’d put forth a few months back that Competency Based Education (and really all digital curriculum) was a way of gradually turning neighborhood public schools into charters from the inside out. I encourage you to take a few minutes to read his piece “Charterizing From Within.” I’m glad this proposition is making it out into the world and finding a wider audience. However there are still many who doubt CBE / Personalized Learning / Blended Learning etc. will ever take hold. This despite the fact that adaptive “personalized” learning systems are popping up all over the country each passing day. Doubters say virtual schools and e-learning don’t “work.” So there; it won’t happen. But therein lies the problem. Many assume that a system that “works” is one designed to serve the needs of children and society as a whole. The present system, however, is being increasingly twisted to serve the interests of global capital markets. When you look at it through that lens, the “failure” of CBE is actually “success.” Succeeding by creating failure moves the ball forward for those who seek to kill the old system and create a new educational paradigm, one custom-built for profit. That is why global capital needs our schools to fail. Comprehensive dismantling of public school districts across the nation will throw open the doors to a new age of social impact investing. If you’re not familiar with the the term yet, please set aside time to read “Impact Investing and Venture Philanthropy’s Role in Sowing the Seeds of Financial Opportunity” carefully. Take the time. It’s important. In the aftermath of the failure that has been intentionally created, venture capitalists will install learning ecosystems in the place of neighborhood schools. These diffuse networks of online and badge-based learning opportunities will be structured for maximum social control, surveillance, and behavior management (the nudge) as well as financialization. Children will no longer be children, but rather commodities to be monitored in real time (Internet of Things), bet upon and securitized. Below is a comment I left on Peter’s piece. I’ve shared it a few places, and some found it helpful, so I thought I would blog it here today. I fully anticipate New Profit will be a central character in the drama that is unfolding. 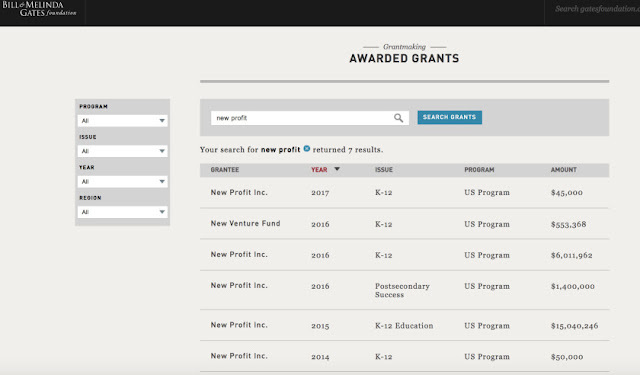 Below is a list of grants they’ve received from the Gates Foundation since 2014, $23 million+.